This is one of my favorite dinners to make because it is quick and easy! I consider this to be “fast food.” It only takes between 15 to 20 minutes. Prepare Fettuccine noodles as directed on box. Start cooking the broccoli. Just add to boiling water and cook for around 5 – 10 minutes, or follow directions on package. When the broccoli is finished, drain and chop. Set aside. In a frying pan, add a little cooking oil. Lightly fry the chicken to warm it up. Then cut into smaller pieces. Set aside. Pour Alfredo sauce over the cooked noodles. Add the chopped broccoli and chicken. Stir well. Next, take the loaf of Italian bread and cut it (length-wise) into 2 halves. Place this on an aluminum foil-lined pan. Top bread with pats of butter, garlic powder and sprinkle with mozzarella cheese. Broil in oven for 1 – 3 minutes, or until lightly toasted. Serve the noodles and bread with one or two slices of oranges on each plate. Enjoy! Oh, I adore easy! Sounds delicious. You come up with wonderful combinations of things. This sounds delicious. You might want to zest the orange and add it to iced tea for that dinner. I do a quick knife peel of oranges and cold brew tea in my fridge with 2-6 tea bags in a 2 qt pitcher with artificial sweetener for me (5-7) but you can do it with sugar the orange zest/peel strips make a wonderful flavor and would go well with the chicken. I like the idea of saving money on the grocery bill. But I also want my family to be healthy. You should include the nutrition information for theses recipes also. I want to know how many calories, protien, fat, and sugar are in them. Thanks! You have a great site though! 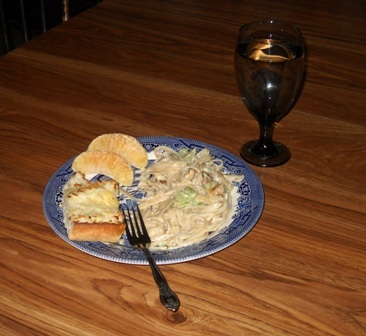 I love the dish…but generally have a tough time with store bought alfredo sauce. I don’t know that I’ve ever found one that can stack up against a homemade version…and the homemade version takes no more time. Check out this video for my version http://www.noreciperequired.com/recipe/fettuccini-alfredo-chicken. A simple sauce of cream and cheese takes less than 10 minutes to make.